The boxer apologised to fans for his recent behaviour in a Snapchat video after Abu Dhabi-based beauty adviser Gulbahor Becknazar shared a video sat in the back of a car with Amir. He said Faryal and her mother were threatening to stop him seeing his daughter again after taking her to New York and he only went out because he was 'so stressed'. A 'frustrated' Amir said he 'did nothing wrong' and will be flying back home from Dubai - before confirming that 'the divorce is going through anyway'. Speaking on Snapchat, he said: "Hi everyone. I just want to apologise for my behaviour yesterday. I know it's something you guys don't wanna see but it's what my ex-wife in a way drove me to do basically. Faryal has drove me, her mother have drove me to do this. "They've taken my daughter away from me, she's in New York. They've taken her away from me. Faryal's threatening for me to never see my daughter again. "I don't want to live like this. I only went out yesterday because I was so stressed with all the drama that's gone on and I just wanted to let myself go. I don't drink alcohol or anything but I just went out with a group of friends to enjoy my night. "Look guys please don't use it against me, I did nothing wrong yesterday, I was just so frustrated with everything that's gone on. I just do apologise and I'm sorry for upsetting you all." Amir, who is currently in Dubai, said he would be jetting back to the UK in a bid to 'sort everything' and would return to training soon. 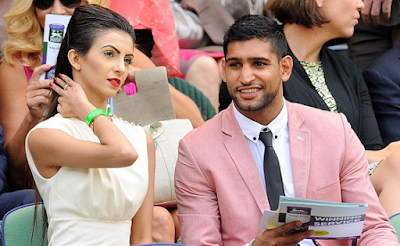 » Do You Know The Lady Who Was With Amir Khan At The Night Club Was Attacked There & Now Left With A Permanent Scar?